Today is Tax Day, and millions of Americans are scrambling to file their taxes before the deadline. As you send in that check to the IRS or eagerly await your refund, have you stopped to think about what the federal government is doing with that money? Most Americans don’t, and for good reason. It’s not easy to find out how your tax dollars were spent, or to understand how your tax dollars fit into the overall picture of federal revenue that funds the essential programs, infrastructure, and services we rely on. 1. The government spent a significant amount of your federal income tax dollars on the Pentagon and war. 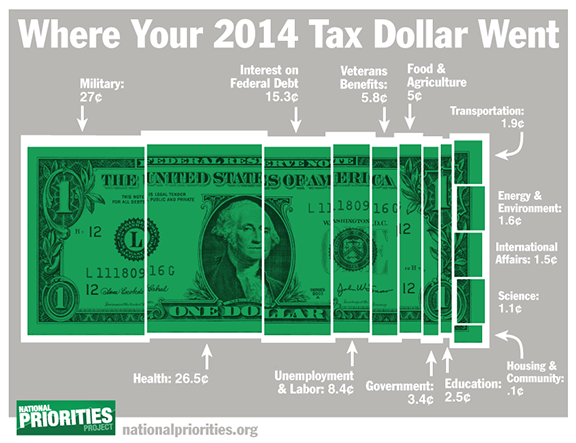 Out of every tax dollar you paid in 2014, 27 cents went to fund the Pentagon, nuclear weapons, and war. Health care programs and services, including Medicaid and the Children’s Health Insurance Program, came next at 26.5 cents on the dollar. Ironically, the programs that most Americans say are top priority, including education, transportation and infrastructure, food assistance, and environmental protection, received only a few pennies each. For the average American taxpayer, paying a total of $12,992 in federal income taxes, $3,500 of that money went to the military while only $30.02 supported job training programs and $14.55 went to preserve and maintain our national parks. Curious to see what this means for your own taxes? Use this tax receipt calculator to look up your personalized tax receipt. 2. People like you and me foot the federal government’s bill. 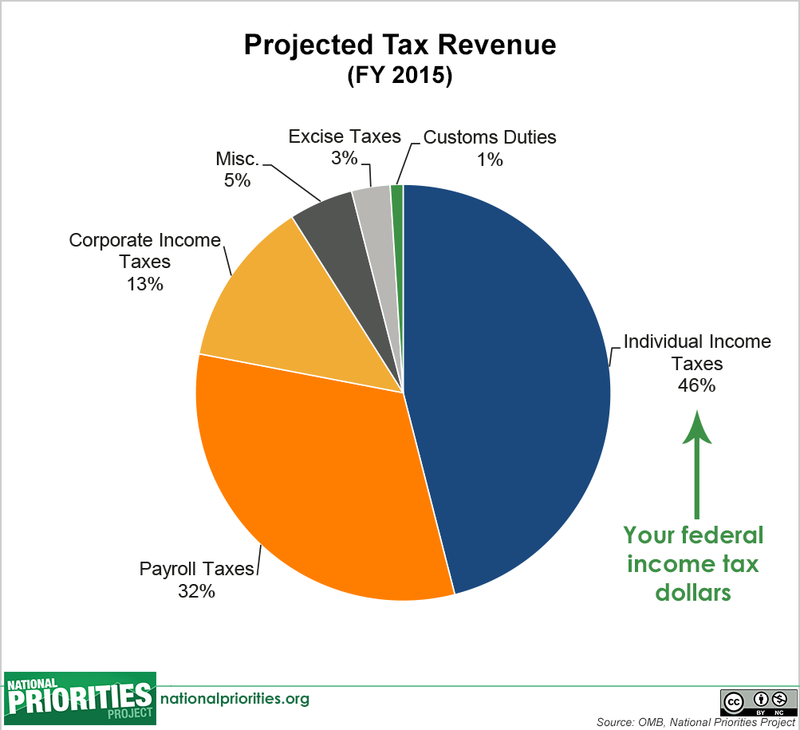 Income taxes paid by individuals account for 47 percent of all federal tax revenues, which are projected to be $3.18 trillion in 2015. Other individual tax revenue comes from payroll taxes, which may show up on your paycheck as “FICA,” and pay directly for Social Security and Medicare, also known as “trust funds.” Counting both income and payroll taxes, nearly 80 percent of all revenue for the federal government comes from individual taxpayers, through income taxes and payroll taxes. Given that the majority of the money being spent by the federal government comes from individuals like you and me, it would be reasonable to expect that our priorities would be reflected in how the government spends that money. Unfortunately, as we saw above, the programs that most Americans care about – job creation, education, safe roads and bridges, clean air and water – get just a tiny portion of the trillions of dollars we collectively put in. 3. Think corporations pay a lot in taxes? Think again. If you listen to what corporate America has to say about their taxes, you’d think that our tax system places an unequal burden on the business industry. That’s simply not the case. 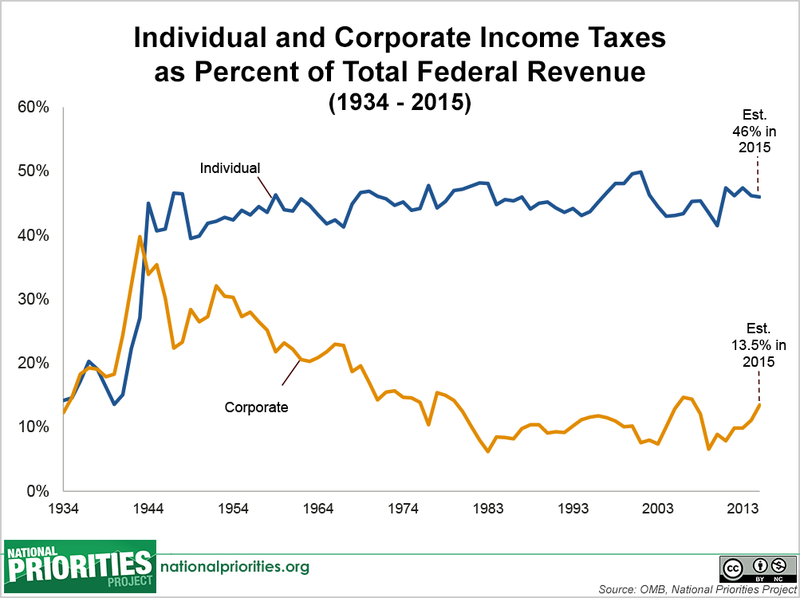 Over the last 50 years, the corporate share of federal revenues has dropped significantly, meaning individuals now contribute four times as much as corporations towards paying the U.S. government’s bills. When corporations make billions of dollars in profit each year (and most individual Americans don’t), how is it possible that they do not pay a larger portion of all tax revenue? The answer is in our tax code. Thanks to hundreds of tax loopholes, corporations can whittle their annual tax burden down to next to nothing – or, in some notable cases, get away with paying no federal income taxes at all. 4. The wealthiest taxpayers are saving a lot more in taxes than you are. Ten of the largest tax breaks on federal income taxes – totaling more than $770 billion in tax savings in 2013 – overwhelmingly benefited the top one percent of households, with 17 percent of the benefits going to those top earners. For example, one of the biggest tax breaks in our tax code, the Special Rate on Capital Gains and Dividends, allows taxpayers to claim this income at a much lower tax rate than other types of income. More than 80 percent of all tax savings claimed through that particular tax break benefited the top five percent of earners – people making more than $209,500 a year. This one tax break cost the federal government $97 billion in revenue in 2013, with $65 billion – 68 percent – of that going right back to the top one percent of Americans (households with incomes of more than $462,500). 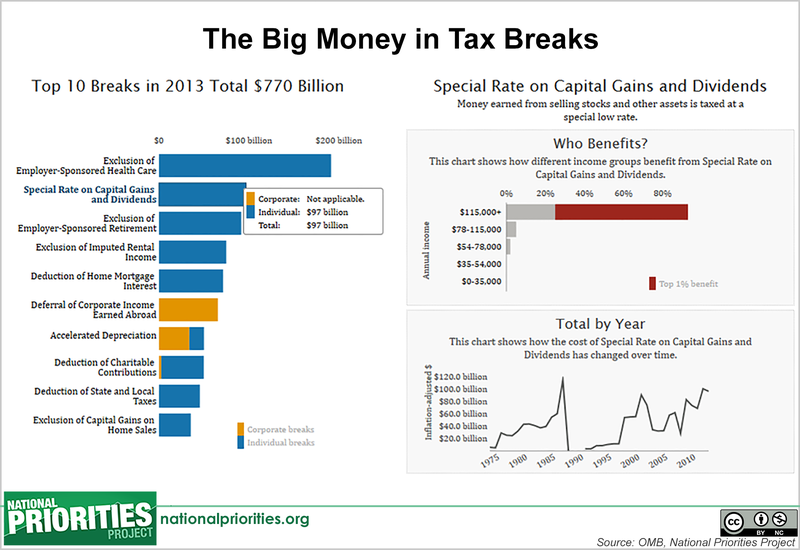 For more information about our tax code and where your tax dollars went, visit www.nationalpriorities.org.